Welcome! We are dedicated to creating high quality, fun custom content for The Sims 2. Check out our great range of free Sims 2 downloads. We hope you enjoy our site! 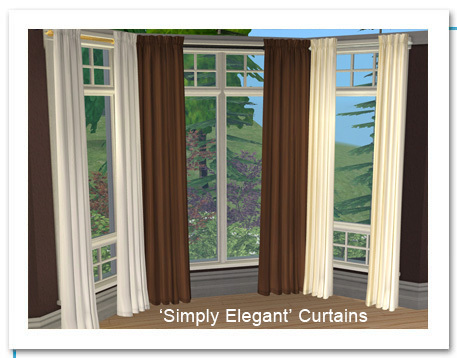 The 'Simply Elegant' Curtain Set, updated and released to regular downloads. The curtain now has two recolorable parts - the fabric and the rail... yay! There's several rail colors - a few wood tones, black, white, brass and chrome. Please note: previous recolors will essentially work with the new updated mesh but please replace our recolors with the latest ones, as they contain the new rail recolors. Old recolors will work as fabric only recolors. TO RECOLOR: Recolor the DoubleLongMAIN mesh only. All other meshes in this set are texture-linked to this package.